I have been working on tracking skills in applications for six years now, and I am convinced we need to get a level deeper by tracking the imparting of methods (represented as a framework) and applications (technology or specific use) in applying skills. Much of this is done implicitly (as teacher’s and experts know the methods they are teaching), but let’s make it explicit by tracking what methods students and young professionals are learning. Basis to understand a competency. There is not much value in saying: “I have been applying critical thinking for ten years.” But if you can say: “I induce, deduce, verify and summarize when I solve a problem. Give me one and I will show you.” Then, demonstrate… There is context. Move forward in learning a skill. Some skills, like ones related to communication, you learn throughout your life. The methods you apply might gradually become more sophisticated. Signal chosen methods and applications. Some technical skills are extremely broad and do not mean much on their own. For example, someone applies the skill of ‘Economic Analysis’ in many different ways. Or a web designer chooses a scripting language ASP .Net, Java, or PHP. Situational application of skill. Different situations, require different applications of skill. I have started to integrate ‘methods and applications’ into my suite of applications: Skills Based Approach, Skill Syllabi, Skills Label and Skills Culture. These applications share a common database and search engine. What is the added value of this search engine compared to others? 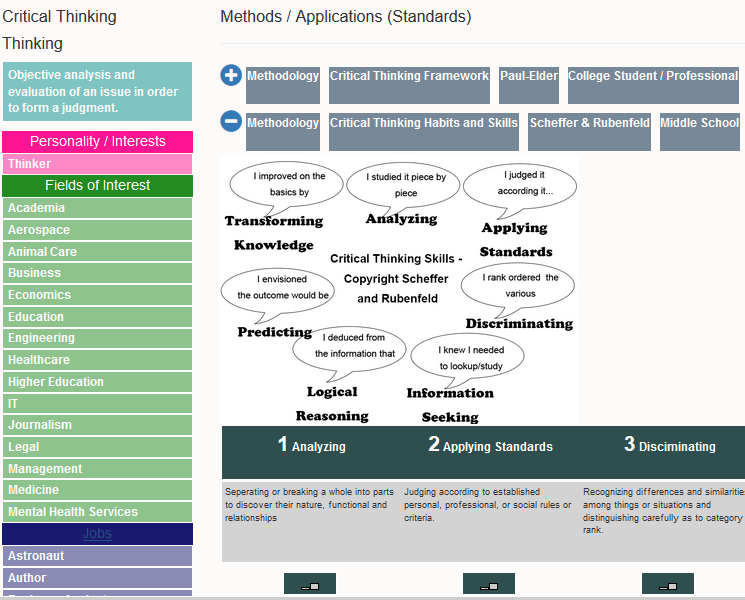 Use the methodologies in Skills Based Approach – a platform for tracking learning. A user can assign skills and their methods as a task. Create and share methodologies with students and colleagues. Create an account, choose a skill, and add your own methodology. Ideally, practitioners use this platform to distribute their methods with an audience. Later iterations include a peer review system.